May 1945 was a bright month for the entire Soviet people. It was then that the capital of one of the most terrible and dangerous states in the history of mankind, the Third Reich, was taken to battle. The joy of seeing photos in newspapers in which Red Army soldiers Yegorov and Kantaria hoisted the red flag on the roof of the Reichstag can hardly be described in ordinary words. The capture of Berlin was forever inscribed in golden letters in the history of the exploits of the Soviet armed forces, and for the population of the country it turned out to be a demonstration of a fait accompli – the enemy was defeated, Nazi Germany fell. This landmark and great event was dedicated to one of the masterpieces of Soviet wartime poster art – the work “Glorious Red Army!” (Also known as “Reached Berlin!”) By artist L. Golovanov. This poster has a very interesting story, connected from joyful and tragic moments. The basis of the product is the reception of recursion. 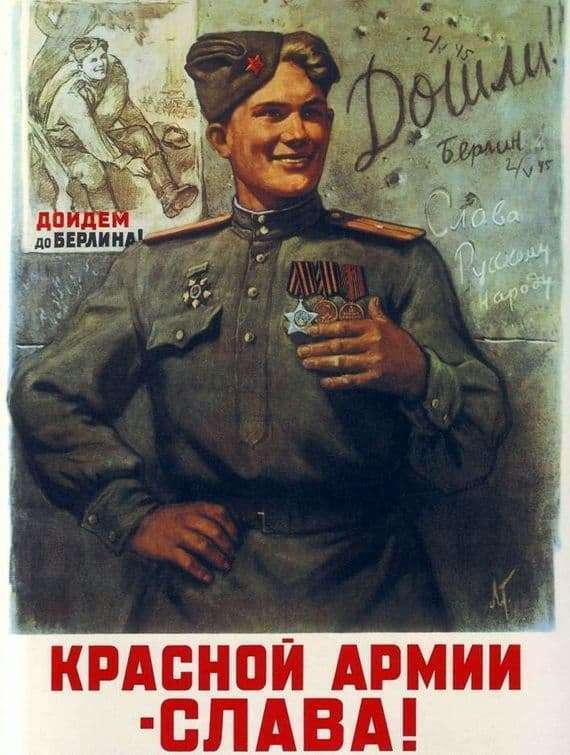 The central image of the poster – a soldier of the Soviet army, happily and with a smile showing their orders. In the background you can see the Reichstag wall, near which stands the fighter. The recursion lies in the fact that on this wall there is a poster “Let’s get to Berlin!” Depicting the same fighter during the break between the next battles. On the wall are also scrawled the inscriptions “Reach!”, “2/5/45” (the date of the capture of the capital of the Third Reich), “Berlin” and “Glory to the Russian people”. The poster sparkles with joy, which was passed on to everybody after a hard victory over the Nazi occupiers. The tragic history of this poster is connected with the prototype of its central image. They were served by a real soldier of the Soviet army, the sniper Golosov. A couple of years earlier, the artist Golovanov painted it in order to create a poster later, “Let’s get to Berlin!”, Which eventually became part of his next work. On it, the winning soldier who happily poses against the background of the Reichstag is also written off from the sniper Golosov. However, by that time the soldier was no longer alive – he died a year earlier, during one of the offensive operations.